Once again I was inspired by a cute and easy Christmas craft that I found on Pinterest, Reindeer Noses, from the blog, A Personal Touch. The original noses were "made" with candy, but I thought it would be fun to make them instead with iced sugar cookies:) This is the easiest sugar cookies you will ever make! Using my favorite sugar cookie/royal icing recipe, and a small (1-inch or so) round cookie cutter, I whipped these little noses up in no time at all. I already have five jars packed up for the oldest munchkins (the other three are infants). Now I just need to make some cute tags and send them off. 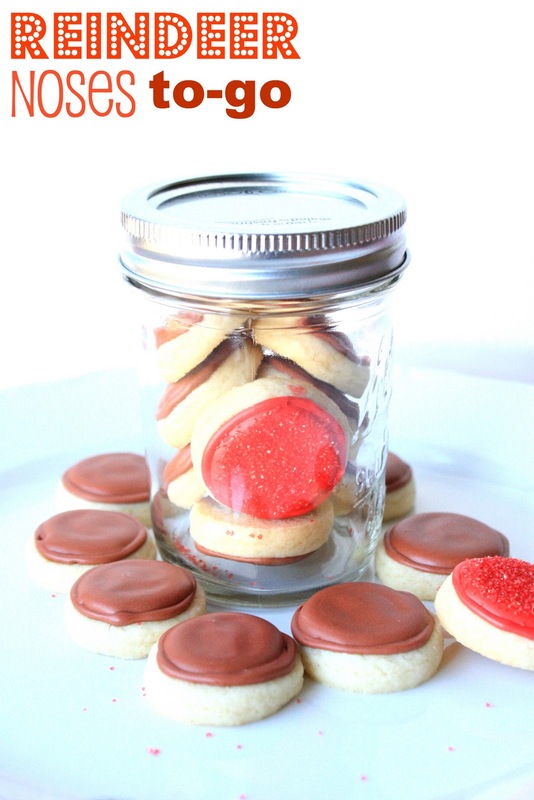 Each half-pint jar has 9 mini cookies: 1 red nose for Rudolph and 8 brown~1 each for Dasher, Dancer, Prancer, Vixen, Comet, Cupid, Donner and Blitzen. How cute are these for a sweet, little snack? That is GREAT. And I love that it has one Rudolph and 8 of the others. Especially because I think the sparkles taste just terrible (despite having a great texture), so you've got eight delicious ones to eat!! I definitely think I want to do this! What a easy but still cute gift. This is clever. So smart and so cute! ^^ Your treats give me so many ideas and so much inspiration! Through the holidays as well as rest of the year. Cutest jar of cookies ever!!! What a fun gift! Sue, those cookies look out of this world pretty and cute! Sometimes the simple things in life are truly the best! I just adore that you packed these in gift jars and that each jar only has one red nose in it. The munchkins are going to love these. How cute are these? A-MAZ-ING! Love the idea :)! I'd be happy to have something like this for Christmas, your family is so lucky to have you :D)!! Wish you lived next door to me! These are so adorable and really cute in the jar. Of course I am going to have to pin it. Great fun. This is a fabulous idea for people like me that are all thumbs when it comes to decorating with frosting. Even I could probably manage to color a circle. Thank you!! These are so cute! I saw these on a linky and knew they had to be yours =o) Awesome! You make the cutest treats. My God! I love your recipes! Today, my mom was doing a cakes, very similar to this. I'm sure my mom will love your blog, I'm going to show to her. 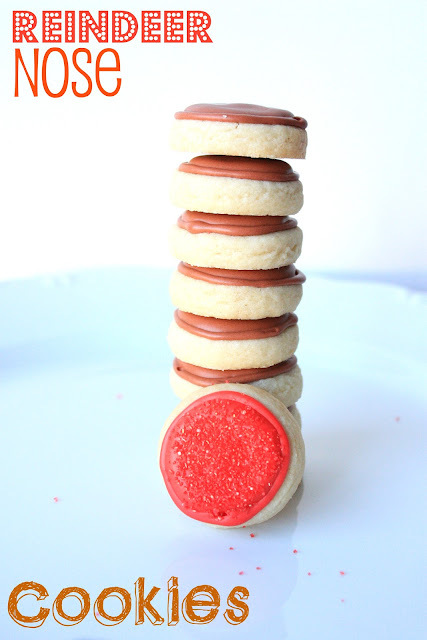 Feel free to also add any other cookie favorites you have:) I really hope you join in! These noses are so cute. Did your grandchildren wear them all at the same time? You must be proud of them seeing them having so much fun preparing for the season. I agree -- the sweetest little snacks I've ever seen! Love that you included a red one for Rudolph. What a fun idea! OOO Looks great! Thanks for linking up to Themed Baker’s Sunday at Cupcake Apothecary! Thanks! You were featured on this week's A Themed Baker's Sunday! But we're keeping the Christmas spirit alive until Christmas Weekend! If you have baking recipes, cooking recipes, or even ideas, bring them over and share with everyone! I'm sure I'm not the first to have done so, but I made a printable to go with these and just posted it on my blog. Thank you for the adorable idea, and for posting your recipes, too! My son's friends loved them!